When Grayson van Vliet entered the world, he had the beginnings of a full head of hair, a big sister, a loving mother — and the woman who carried him for nine months. 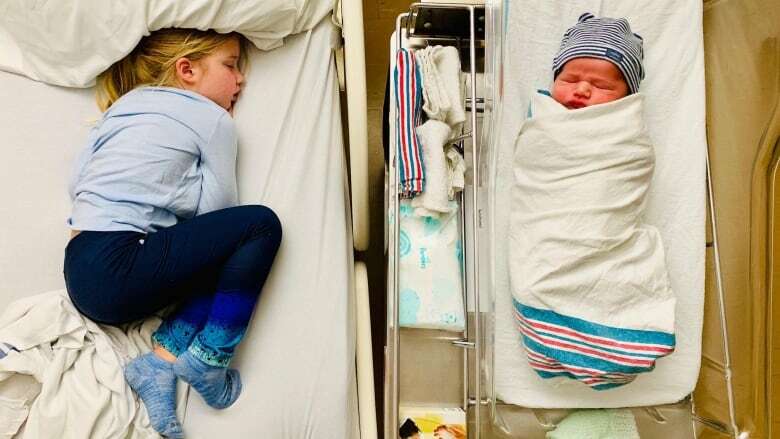 When Grayson van Vliet entered the world last week, he had the beginnings of a full head of hair, two tiny hands to press against his face, and a big sister. Plus a hat, because babies get those right away. He also has both his mother and the woman who's been pregnant with him for the last nine months. Grayson's mother Kimberly is unable to carry a child because of breast cancer treatments which — even though she's been declared cancer-free — will continue for another seven years. "We talked about the possibilities, including adoption, but ultimately decided that if we could make it work, we would go through a surrogate," she said. Jessica Fullerton, who served as the couple's surrogate, knows the pain Kimberley is feeling. "We really struggled with our family and having our kids. We had pregnancy losses and [had] to go through fertility treatments," she said. "It was a really long, dark haul for us." After her own struggles conceiving a child, Fullerton decided she would help any woman facing similar challenges. "I had really good pregnancies, I felt very healthy, and so I felt that this was something that I could do for someone if the opportunity arose," she said. "That it would be something that I would want to do." She met the van Vliet family through a mutual friend, and when they asked if she would be their surrogate, it was an easy decision. "I kind of jumped at the chance to be able to kind of help them with a 'happily ever after,'" Fullerton said. If Fullerton had decided not to be their surrogate, van Vliet said she might not have had another child. "I know there are plenty of women within Canada and outside of Canada who have had lovely experiences with strangers who are surrogates, but I don't think that was for us," she said. "I would be lying awake at night for nine months wondering if our surrogate was still around." She'd also been warned it could cost between $60,000 and $80,000 to find a surrogate through an agency — half of which would have gone to that agency. Paying for surrogacy is illegal in Canada, but agencies can charge consulting fees and surrogates can be reimbursed for their expenses. Fullerton lives in Ottawa and van Vliet lives in Pickering, Ont., just east of Toronto. Despite the distance, the surrogacy process has brought the two families closer. When it came time for Fullerton to break the news to Kimberly and her husband that she was pregnant, their family was already in the Toronto area, visiting family. Fullerton said they initially couldn't think of just the right way to reveal her pregnancy, but they eventually came up with a perfect surprise. "We had a little plastic Easter egg and we put a note in it that said, 'You're having a baby,'" she recalled. "My daughter Elliot, we gave her the Easter egg. And she knocked on the door and she gave the egg to Kim." It was still a big shock, van Vliet said, even though they were expecting the news. "We spent that afternoon together and we just kept looking at each other, all of us, saying, 'Wow, this is actually happening." Grayson van Vliet was born in Ottawa last week. A few weeks ago, when van Vliet was in Ottawa, she said her son's impending birth was gradually becoming more and more concrete. "Probably the first time I saw Jess with a bump, it became very real for me. But also just buying all the baby stuff, getting the room ready." Speaking before the delivery, Fullerton said she'd always have a bond with Grayson — even if she's never thought of him as her baby. "The thing that I look forward to is not necessarily holding this baby, but when Kim and Derek are meeting this baby for the first time," she said. "That's the part that gets me excited." Fullerton said she was prepared for postpartum depression and had a therapist lined up, just in case — but added that she felt at peace with everything. "I felt so great going through everything that I've kind of been waiting for the other shoe to drop." She also said she qualifies for maternity leave, something she's looking forward to. "It'll give me a chance to focus on my family … and be able to take the time that you might not have otherwise because life is so crazy." On Nov. 28, Fullerton gave birth to Grayson in an Ottawa hospital. 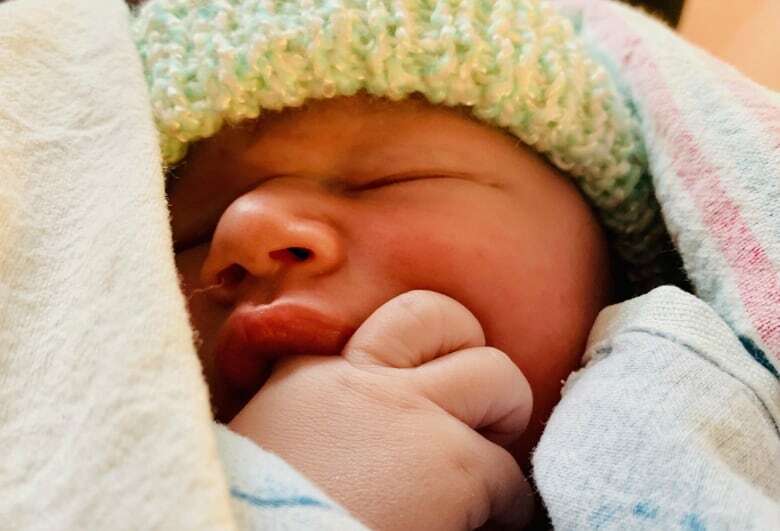 He arrived weighing a healthy eight pounds, nine ounces. Both van Vliet and Fullerton say they don't intend to drop out of each others' lives. "[We'll be there for] things like first birthdays and holidays. We will continue to stop in with them on our way home for Thanksgiving next year," said Fullerton. "I just see it as, of course we'll be a part of each other's lives." Along with baby clothes and other hand-me-downs, Fullerton gave van Vliet a bassinet her own children used. That gift, van Vliet said, will serve as a connection between Grayson and the woman who carried him. "Having that sort of reminder every time we look at him in it and put him in it, I think, is pretty important to me."